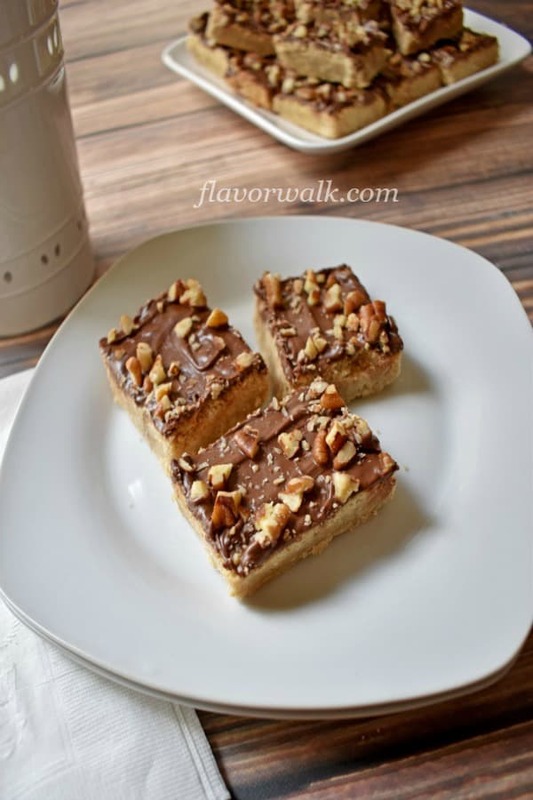 Gluten Free Chocolate Toffee Bars are the perfect treat any time you have a craving for a little something sweet. 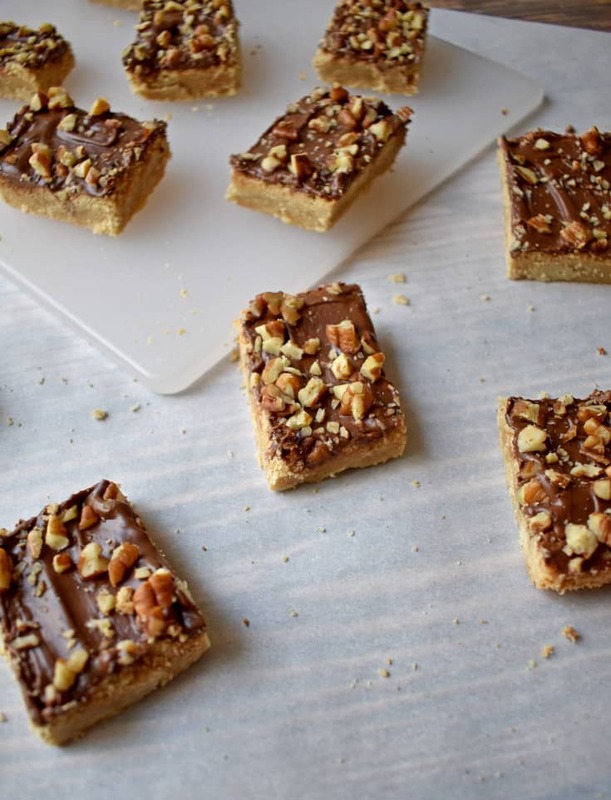 These buttery, toffee flavored bars, topped with sweet chocolate and crunchy nuts are simple and delicious. Every so often (like every day) I get a craving for something sweet to eat. Sometimes I’m willing to put in a little effort and other times I want something simple and easy to make. Although I want simple and easy, I still need sweet and delicious. 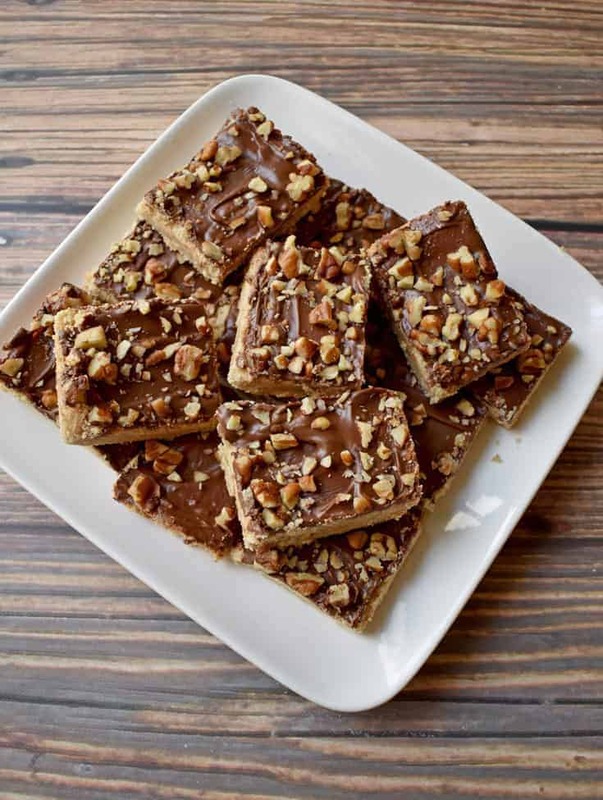 This chocolate toffee bars recipe fits the bill. 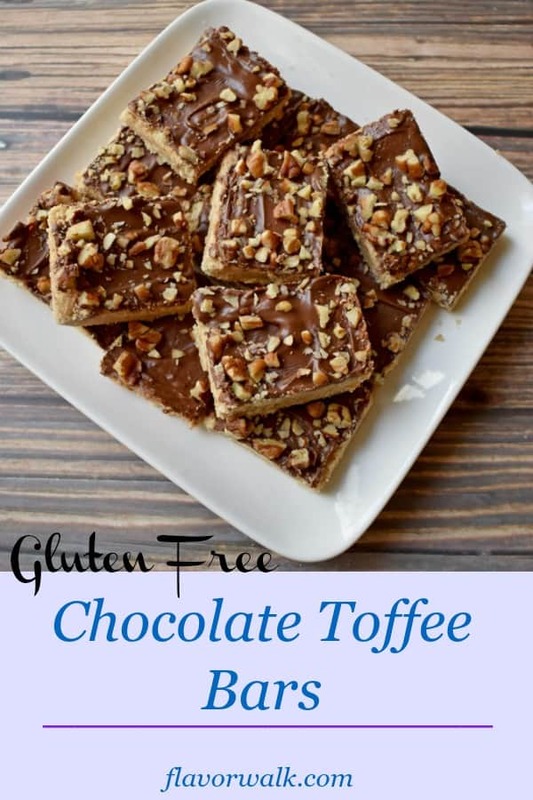 These gluten free chocolate toffee bars can be mixed together in one bowl. Simply combine all the ingredients, except the chocolate and nuts, and stir until you have the consistency of thick dough. Press the dough out in an ungreased 9″x13″ pan and bake at 350 degrees for 25 minutes. Once you take the pan out of the oven, scatter the broken chocolate pieces over the baked layer. Wait about 5 minutes, allowing the chocolate to soften, then using a spatula spread the chocolate over the baked layer. Sprinkle the chopped nuts over the chocolate and allow to cool for 30 minutes. Now, you can cut into bars and enjoy. You’ll notice from the photos that my bars are not uniform in size. No matter how many times I try, I’m unable to cut in a straight line. Luckily it doesn’t affect the taste. Use a 9″x13″ baking pan with straight sides, instead of rounded sides, to give the bars a clean, crisp edge. Make sure the butter is softened before mixing with the other ingredients. I take butter out of the fridge the night before and leave it on the counter to soften overnight. Scatter the broken chocolate pieces evenly over the top of the baked layer. This makes it easier to spread the melted chocolate and completely cover the bars. 9″x13″ baking pan – The straight sides of this pan make it perfect for making brownies and bars. Silicone spatula – The spatula makes it easy to spread the softened chocolate over the bars. You could also use an off-set spatula. If you don’t have a spatula, try using a table knife. Have a craving for something sweet? 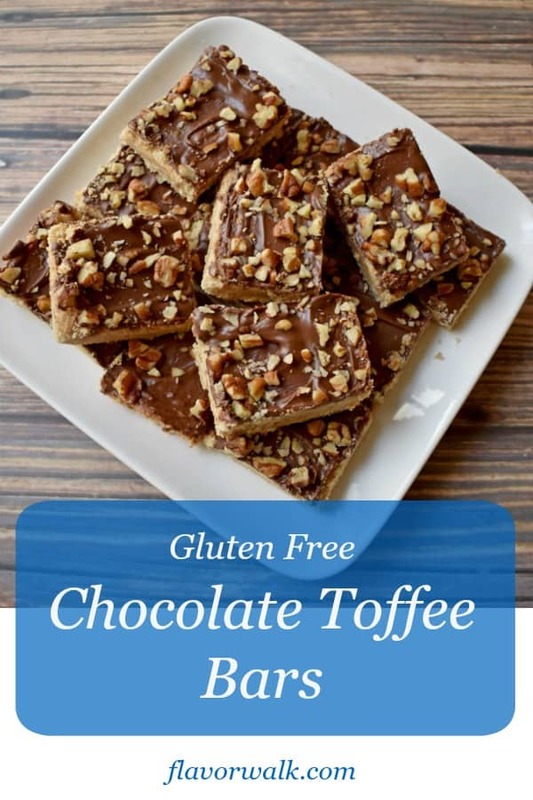 Give these Gluten Free Chocolate Toffee Bars a try. They’re simple to make and oh so tasty. Enjoy! LOOKING FOR MORE GLUTEN FREE SWEET TREATS? If you liked this recipe, follow my Gluten Free Brownies and Bars board on Pinterest. These buttery, toffee flavored bars, topped with sweet chocolate and crunchy nuts are simple and delicious. In large mixing bowl, stir together butter, sugar, egg yolk and vanilla until combined. Add in flour, xanthan gum, and salt and stir until everything is combined and the mixture forms a dough. Spread the dough on the bottom of an ungreased 9"x13" baking pan. Use your fingers to press the dough evenly around the pan and into the corners. After taking the pan out of the oven, lay the chocolate pieces all over the top of the bars. Wait 5 minutes while the chocolate softens, then spread evenly over the baked layer. Sprinkle the walnuts over the top of the chocolate and let cool for 30 minutes. You don't need to add xanthan gum, if the gluten free flour mix you use already contains it. This is my favorite recipe and my husband loves them. 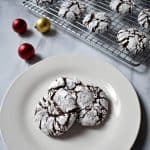 A great treat and so easy to make. Thanks Lisa! I’m so glad you enjoyed them.